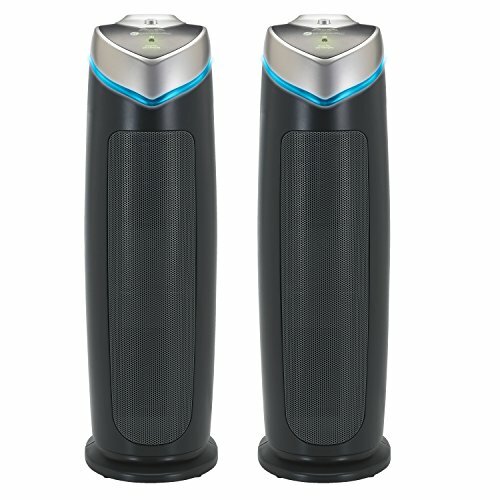 This is a 2 Pack of GermGuardian AC4825 Air Purifiers. The 3-in-1 Air Purifier is perfect for allergy sufferers. With a True HEPA filter, it captures 99.97% of dust and allergens as small as .3 microns in size! According to the American Academy of Pediatric Allergy and Immunology, doctors recommend HEPA air filtration to reduce exposure to indoor asthma triggers. More than just a filter, the UV-C light kills germs, while the charcoal filter captures odors. CADR Rated 100+ and standing 22 inches tall, it is lightweight and ideal to use in medium sized rooms. Includes a UV-C control and a filter change indicator. Choose from 3 speeds, including a low speed that runs ultra-quiet. GermGuardian AC4825 2 Pack. True HEPA Filter captures 99.97% of dust and allergens as small as .3 microns such as household dust, pet dander, mold spores and plant pollens. Charcoal filter reduces common odors from pets, smoking and cooking.